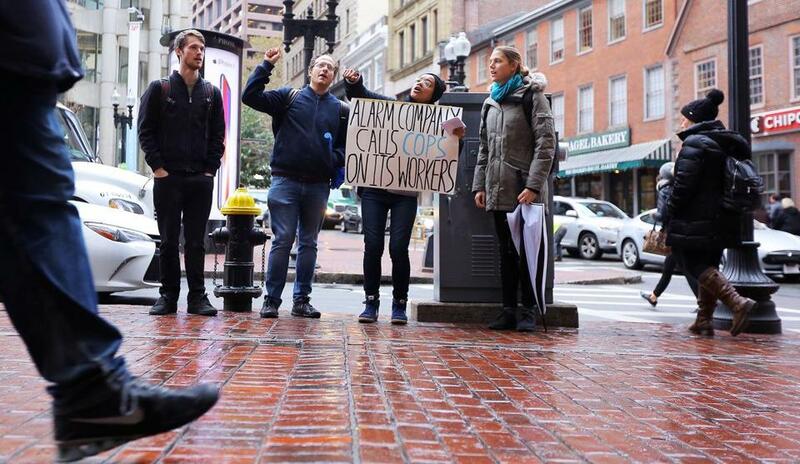 Two suspended SimpliSafe workers, Abraham “Abbie” Zamcheck (second from left) and Lauren Galloway (third from left), protested outside the company with two supporters, Cole Rainey-Slavick and Alice Pote. Bedbugs are typically associated with seedy motels and stuffy college dorms, not downtown office buildings. But an infestation of the biting pests at a Boston home security company has angered some of its employees, who accuse management of downplaying the problem and spraying chemicals in the office during business hours. The company, SimpliSafe, denies the claims. The three employees, who work in the company’s call center, said they launched the same chant inside the office last week and were suspended with pay. One employee, Abraham Zamcheck, was arrested on disorderly conduct charges after he stood on his desk to lead the chants, he said. Zamcheck, 32, and two colleagues said in interviews that company’s handling of the bedbug infestation was a symptom of deeper problemsin its workplace culture. SimpliSafe, which sells wireless security systems, acknowledged the bedbug infestation but said a pest control agency treated the officeonly after employees had left for the day. About 300 people work in the office, employees said. The call center provides customer support and troubleshooting tips. Managers held team meetings to make sure workers were aware of the treatments, the company said. The company believes the bedbugs were brought in from the outside. After a number of employees suffered bug bites, Costello, Zamcheck, and colleague Lauren Galloway, 22, circulated a petition that demanded an apology from management and a pledge for more open conversation going forward. On Nov. 6, copies were posted in two break rooms. “It has come to our attention that there is a bedbug infestation in the office and that management and HR have known about this for some time,” the petition read. Only 35 people signed the petition, with many fearing the consequences if they did, workers said. Bedbug infestations in offices is rare, specialists said. Ultra Safe Pest Management, which has offices in Boston, Canton and Topsfield, fielded about 500 commercial bedbug reports in the past year. Only 25 were from offices. Bedbugs usually hide in the furnishings or chairs, he said. 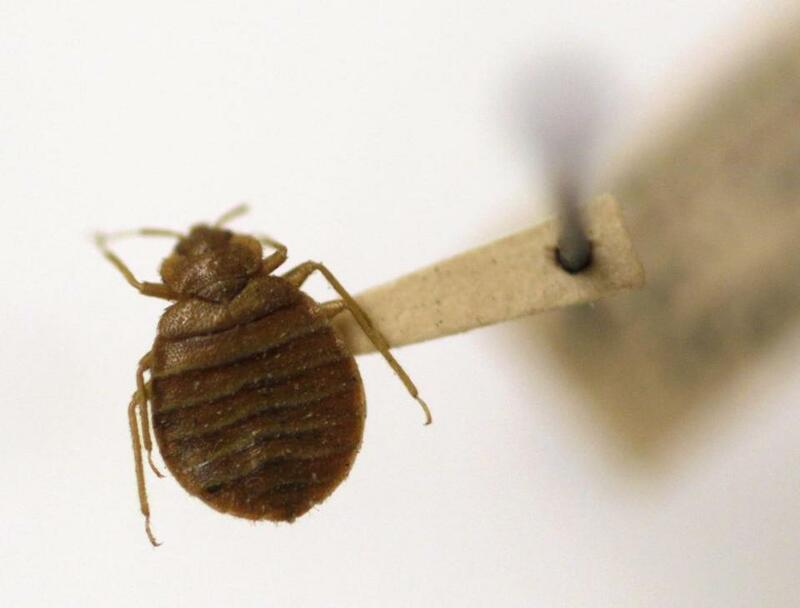 In October, a bedbug was found at the Uphams Corner branch of the Boston Public Library. The city’s inspectional services department said SimpliSafe did not report the infestation. After an inquiry from the Globe, the city launched an investigation, a spokeswoman said. After seeing the message,Zamcheck stood on his desk and began to chant: “No bedbugs, no [expletive], and “Hell no, we won’t go.” About 10 others joined in, employees said. Managers called the police, who arrested him. The company said the bedbug issue has been resolved, but they will continue to monitor it. Galloway described the bug problem as a “tipping point” that caused suppressed grievances to boil over. The three workers said many of their colleagues are unhappy with various aspects of the work culture, but are afraid to voice their concerns. On a recent morning, the trio and a few friends stood outside the office, chanting and handing out flyers. “Stay strong,” a woman said as she entered the building. “You know, it’s harder on the inside,” Zamcheck replied. A bedbug displayed at the Smithsonian. Natasha Mascarenhas can be reached at natasha.mascarenhas@globe.com. Follow her on Twitter @nmasc_.